Citicoline, a popular nootropic supplement that is also known as CDP choline (cytidine diphosphate choline), is an organic molecule produced endogenously and is found in all living cells. The two major components of Citicoline are Choline and Cytidine (Cytidine is converted to Uridine in the body). CDP choline is a precursor for the synthesis of important phospholipids. These phospholipids are essential to cell membranes including phosphatidylcholine, phosphatidylserine, and phosphatidyl-ethanolamine. Phospholipids must be continuously synthesized for adequate function of cells due to their high turnover rate. How Does Cognizin Citicoline Powder Promote Cognitive Function? Cognizin has been studied in a variety of human clinical trials. 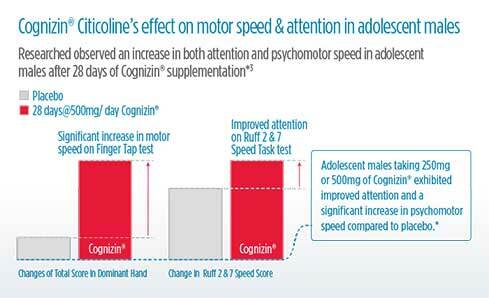 The most recent human clinical trial focused on the benefits of Cognizin on healthy, middle-aged men and women. Conducted at the Brain Imaging Center at McLean Hospital, researchers found increases in brain activity among participants that had taken a Cognizin supplement for six weeks. Of particular note, differences were noticeable in those participants that performed tasks that required sustained attention. Clinical trials have also found that Cognizin citicoline supports healthy mitochondrial function. These powerhouses within our cells are what actually produce the brain’s energy. * Healthy mitochondrial function results in higher levels of ATP (Adenosine triphosphate)— our bodies primary energy storage molecule—in brain cells. Citicoline is commonly paired with dietary supplements or nootropic compounds in various nootropic stacks. As a dietary supplement, take 250mg of Cognizin Citicoline 1-2 times daily. To learn more, read the Cognizin Citicoline reviews and experiences below. Where to Buy Cognizin Citicoline Powder? Nootropics Depot offers 30g or 60g jars of high quality Cognizin Citicoline powder. Nootropics Depot's Cognizin Citicoline has been lab-tested and verified for both product purity and identity. You may also be interested in Cognizin Citicoline capsules. will but more!!!! looking to be like ray kurzweil!! Love this product, its pure and a great package!!! Works Really Well! - Just watch the half life! 50+ hours! I just wanted to create a second review, this stuff works great, just be careful and aware that the half life on this stuff last over 50+ hours, if you don't believe me research it for yourself! Bought it as part of the sampler and felt the effects. Positive mood and clarity of mind. I made an order on the Monday evening and on Wednesday it was already delivered! Recommended for anyone with insufficient sources of choline in their diet, such as eggs, etc,, or someone who uses a type of racetam. This is probably one of the better brands I've tried for citicoline, though it's sad to see ND has essentially stopped selling this product, since it hasn't been in stock for months. I've gotten several things from nootropicsdepot before and never had any issue. When the Citicoline powder came in, there was powder inside the plastic seal around the bottle. Better safe than sorry, I emailed their support and asked about it. I didn't get the typical copy-paste response one would normally expect. I got a clear, concise response targeting exactly the issue I brought up. They said that it is normal and can happen when the powder isn't blown off well enough. This is my favorite choline source by far. I can certainly say it works for me. Alpha GPC works well too. However this gives me more reliable daily effects.